Product code: ES8200 Categories: Art Deco, Art Deco Earrings. Here is the most magnificent pair of aquamarine and diamond drop earrings from the Art Deco era of the 1920’s, that are spectacular and exemplify the quality and craftsmanship of this era. Exquisitely hand made in platinum, each earring is set with a pear cut aquamarine that stands out against both the sparkle from the diamonds, and the pure white colour of the platinum. Measuring a very elegant 39.4mm in length by 15.6mm wide at its widest section, each earring is set with 28 diamonds that totals 0.98 carats and the two aquamarines total 1.86 carats and have such a perfectly matched fine blue colour. 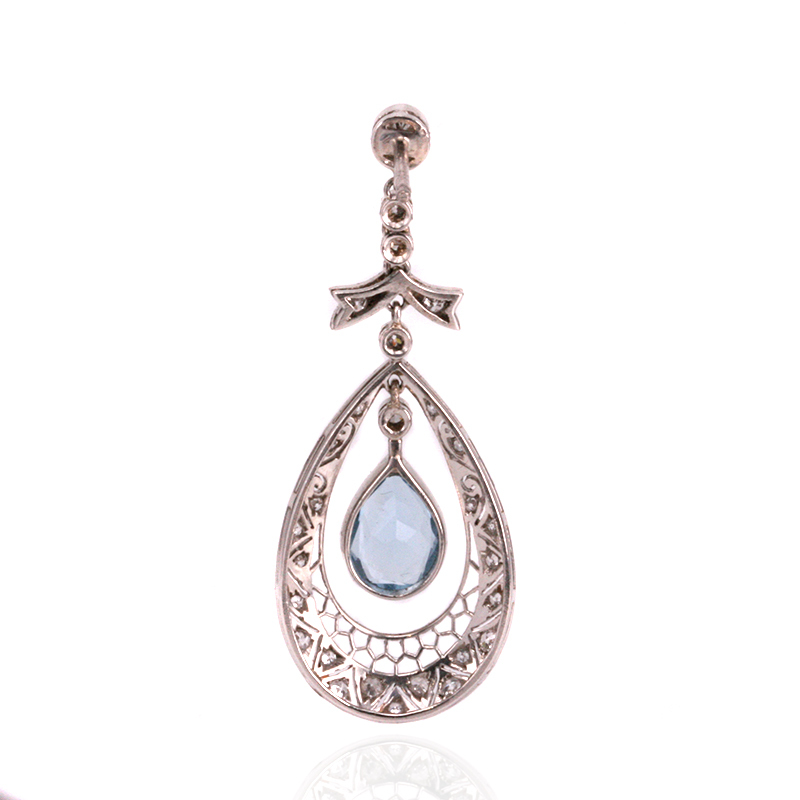 However it is not just the aquamarines and diamonds that make these earrings so special, it is also the incredible detail of the setting that could only be achieved by being made in platinum which has the distinct advantage of being drawn into a fine wire while still retaining so much strength. Fitted with post fittings that take the secure butterfly ends (not pictured) these are a magnificent pair of Art Deco earrings that will truly be loved and admired every time that they are worn. Tags: Art Deco aquamarine and diamond drop earrings, Art Deco earrings. These Are Deco earrings were hand made in platinum. Platinum was popular between the two world wars as it is the purest of all the precious metals used in jewellery. It also has the major advantage of being incredibly strong even when drawn into a fine wire.